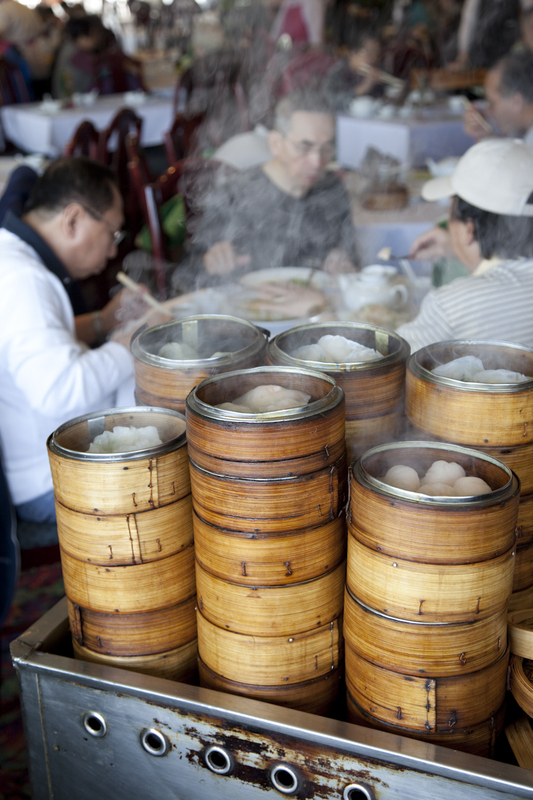 If you live in Toronto, you have to really want dim sum to drive 40 minutes to get some. And it better be good. We’ve got Chinatowns galore in this city and it seems crazy to make the trek to Mississauga for the sake of a dumpling. But today, my posse and I would not settle for less. So we drove west, far west, to Hurontario Street to the Emerald Chinese Restaurant (30 Eglinton Ave. W; 905-890-9338) where they wrap up their tall boulevard trees so strangely, they look like they belong on the storybook pages of Dr. Seuss. We were ready for anything and everything. Emerald seats 400; serves dim sum daily; the selection is vast; and the prices are reasonable — if not astounding. Unlike most Chinese establishments, they even accept credit cards. There’s just one problem: weekends attract so many devotees to this har gau mecca that they hand out numbers and use a loudspeaker to manage the sorry (but eager) waiting sardines knocking elbows in the foyer. We’d seen what an impenetrable front foyer dozens deep could look like last February on a long weekend. We’d asked friends Allan and Nora to meet us there, but for naught. Happily, our second try (on a weekday at the safe hour of 11 a.m.) proved lineup-free. 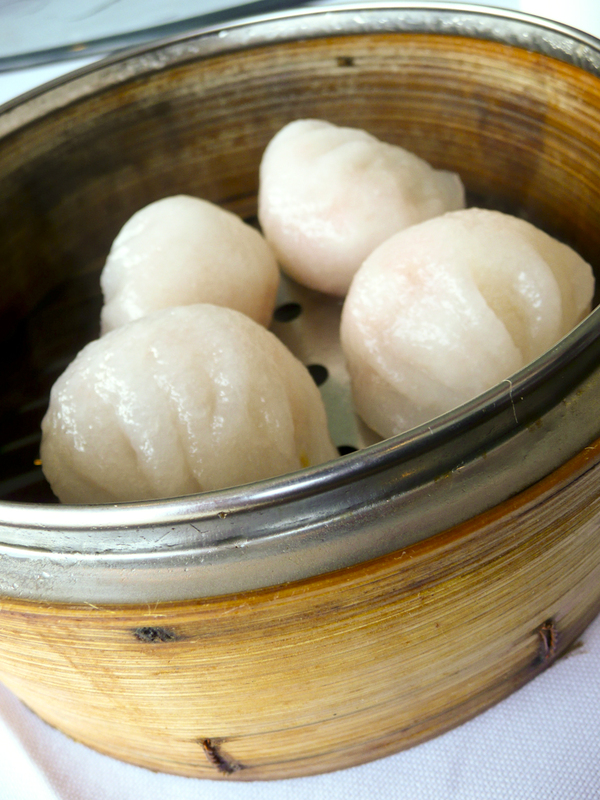 Dim sum is not for the feeble in food spirit. It’s a risk taking adventure where you point at what looks good and pray to the food gods that you strike something tasty. Emerald serves up classic Cantonese dim sum and as such, must be judged by the two holy standards of the cuisine: har gau and siu mai. Whole, juicy shrimps bathed in a little sesame oil made the har gau worth pointing for, but the siu mai were sadly monotonous, filled with an overly ground pork that called out for the addition of ginger and textural crunch. Plenty of crunch could be found elsewhere. Carts piled high with deep-fried specialties passed by often. We sampled spring rolls, bulbous shrimp wontons, and scallop and shrimp combo-acts that were crisp, hot and fresh out of the deep-fryer. Two, pudgy crab claws with moist, sweet interiors arrived with a pink-tinged sauce labelled “red vinegar” by the cart-pusher. Within its rosy depths, super taster Nora detected hints of cinnamon, star anise and white pepper and proclaimed it just the right dip for those claws. Regrettably, dips and sauces are not Emerald’s forte. Their hot sauce is a pallid affair with imperceptible Scoville heat units and I take offence to mayonnaise offered as an accompaniment to deep-fried fare (Belgians, I know, wouldn’t). But, in the spirit of yin/yang, where there is weakness there will always be strength. And if the dips did not impress, the braised and steamed dishes surpassed expectations. Such as their steamed scallops (sweet, soft and pungent) that slipped off our chopsticks and back into the luscious bed of sautéed water spinach (called empty-hearted veggie in Chinese for their hollow stalks). Also yum (if not challenging) were the chicken feet: deep-fried then red-braised offering a mouthful of little bones, but deep chicken flavour in return. We ordered two types of sticky rice. One was hidden under a glass bowl, an upside down affair. The server flipped the bowl and poured soy sauce on to the mound of rice (see what I mean by lackluster dipping sauces?) But still, the rice was flecked with tiny morsels of barbecued pork, sweet Chinese sausage and dried shrimp. The posse liked this, but my favourite was a parcel of sticky rice wrapped inside a lotus leaf, for the rice was plump and soft, flecked with pork of all manner, some of it jellied. 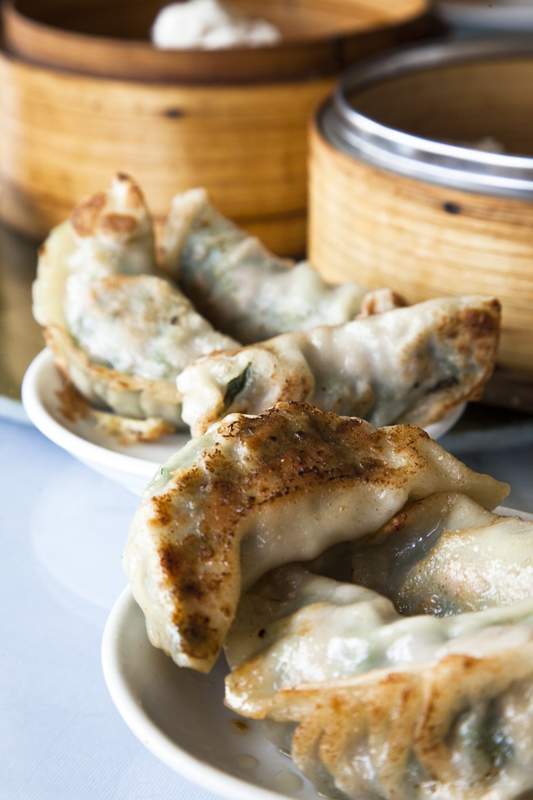 For Krystal, dim sum dining is not complete without pot-stickers and it helps when you can ask the server where the heck they are. (Pssst, they’re called guo tie and good luck pronouncing that, let alone getting the tones right.) My tones were wrong but my smile was wide. Somehow three plates of pot-stickers landed on our table just before our departure. They were worth the wait. These hulking beauties were full of meaty morsels flecked with Chinese garlic chives, their bottoms nicely caramelized and addictive. We took home a box and lovingly dipped them into a northern-style hot sauce (la jiang) that befitted their splendour. This entry was posted in Cantonese cuisine, Chinatown, Chinese snacks, Dim sum, Restaurant reviews, Toronto food finds and tagged chicken feet, crab claws, Emerald Restaurant, har gau, Mississauga, shrimp wontons, Siu mai, steamed scallops. Bookmark the permalink. sounds completely yummy. gotta go there sometime. Just fly a few thousand miles and you’ll be there! Your review has made me very hungry! Should we venture west, we will surely give this place a try. I know you and I both like Pearl Court on Gerrard but this place is 10 times bigger and the selection is vast. In fact, the selection is BEST on weekends. but do they use msg? I know of only one msg less restaurant in toronto and that’s lee gardens on spadina near dundas. I spoke to some experts from china and they were dismissive of toronto cuisine because of all the msg. any input? I think they use msg. I am not sensitive to msg and have eaten so much of it in Asia that I don’t think to ask whether or not they use it. However, two members of my dim sum posse em’ed me after the meal saying they thot the meal was high in msg. Some Chinese consider the use of MSG to be the MacDonaldization of their food. It used to be marriages of ingredients, blends, sauces were tasty due to preparation and freshness. Now it’s kicked up a notch to quote Emeril without any intermediate steps. It would be great to know what others dont use MSG – maybe I am just being hopeful but surely there is more than one chinese restaurant that has stopped using it? In the meantime and absent the list, I just need to remember to drink alot more tea, water and beer!